So you're thinking about making home repairs yourself. Not a problem! With a little bit of know-how and a lot of planning, even a beginner do-it-yourselfer can put some sweat equity in their home. Before you begin making home repairs on your own, you need to start with a three-step plan. The first step is to categorize all of your home projects. 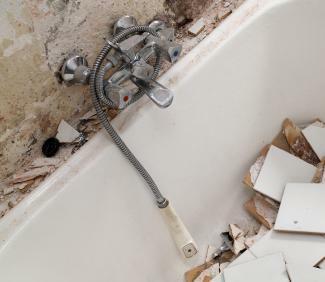 The key to successful home repairs is to only take on what you can handle. Figure out which repairs are critical and which repairs can wait. When factoring in the priorities, try to balance personal comfort and resale value. The top of your repair list should be dominated by items that will improve your day-to-day life, i.e. expanded closets, additional bathrooms, kitchen improvements. Next should be items that save you money and are much-needed fixes, i.e. installing gutter guards, fixing dripping faucets, replacing old windows with energy efficient models. Finally, you should consider home repairs that will increase the resale value of your home, i.e. additions, new decks and patios. The second step is to determine which home repairs you can handle on your own and when you should call in a professional. Consider proficiency, skill level, time to complete the project and cost. If you've never held a wrench and think snakes are just venomous creatures, then plumbing projects are probably beyond your scope. The third step is to research your local building codes and pull the necessary permits. Building codes vary state-by-state and town-by-town. It is your responsibility as the homeowner to know the local codes and obtain the necessary permits. For cosmetic repairs, it is a good idea to keep a paint chart of all of the paint colors you've used in your house. That way, you can easily purchase the paint needed for minor touch ups. Likewise, know the types of light bulbs and wattage for all of the lights in your home. That way, there is no reason to live with burnt out bulbs for any length of time. If you are seriously thinking about making home repairs yourself, you should learn as much as you can about the projects you plan to undertake. Local hardware stores and adult education programs often offer seminars on different topics such as building decks, repairing appliances, and installing patios. There are a plethora of do-it-yourself magazines that dispense practical advice and publish how-to plans. Cable television networks like HGTV and The Discover Channel have programming that inspires and educates homeowners. Hometime features professionals from the TV show of the same name. It includes videos and articles on a variety of home improvement projects. Bob Vila is one of the big names in home repair and home improvement. He has appeared on TV shows for many years. His site also includes videos and articles as well as a forum. This Old House is another popular home show that has appeared on TV for several years. This site also includes a forum in addition to the resources. Do It Yourself also features a forum and articles on almost any home topic. DIY Network is a popular TV channel specializing in DIY projects. You'll find features from the shows as well as general advice and how-to information. When you want to do home repair yourself, a combination of experience, determination and research comes in handy. You can save a significant amount of money by doing your own home repair. You also get the satisfaction of knowing you tackled a home repair yourself. Don't be intimidated by home repairs; just be savvy. Try to stay on top of regular home maintenance and for larger jobs, know what you can handle and when to hire a pro.